DNO_Dennis, Lawrence of Berkley , and I took a drive out to Plymouth Michigan tonight looking for some good shots of the holiday lights. We ended up walking around Kellogg Park right in their downtown and struggling to find good subjects (probably about half the trees were not lit tonight). 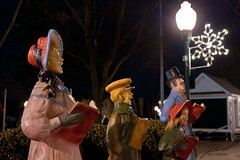 These carolers caught my attention, largely for the fact they were portable statues. Being right along the main road though they were not easy to shoot.